We decided to taste some port wine, not because we are fanatics, but because it would be weird to come all the way to Porto and not taste it at all. 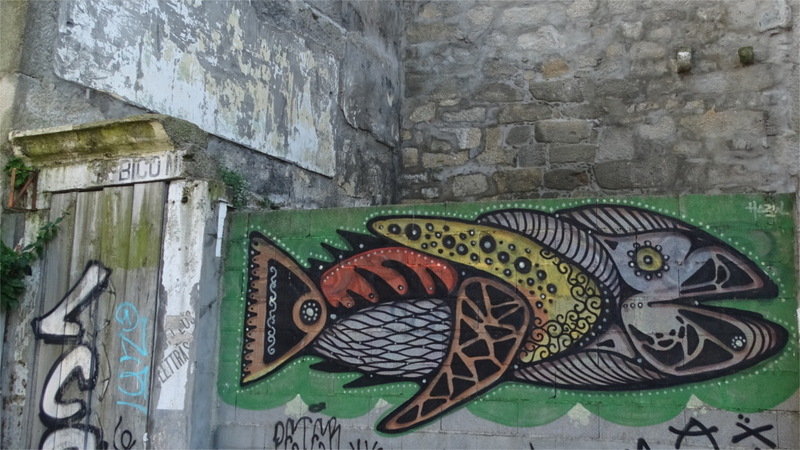 It turns out that you have to cross the Douro river and go to Vila Nova de Gaia to do this. 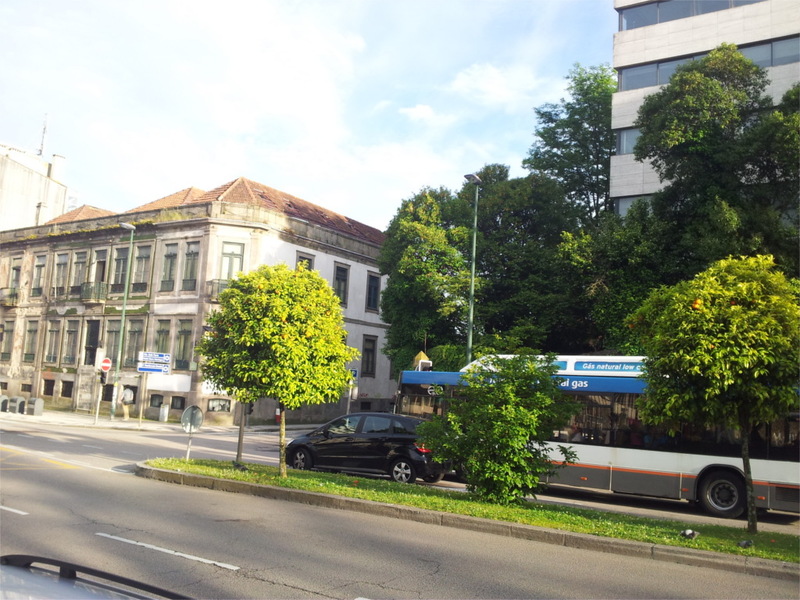 We could have taken the metro, it is one station out from Sao Bento. But we decided to walk across the upper deck of the Dom Luis bridge. We walked up from the Sao Bento station, got a little lost, and then, with some help from friendly natives, found ourselves next to the Metro rail which crosses on the same deck. Being suspended about 45 meters above the surface of the earth gives you a new perspective on the life of a city. 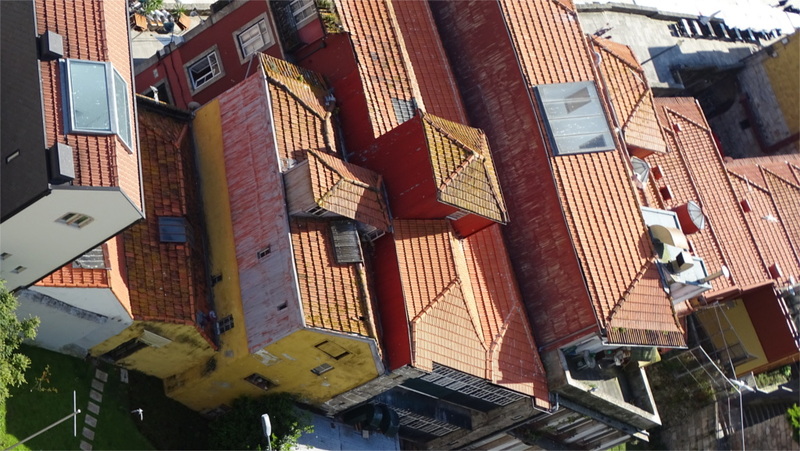 The first thing we noticed is that the lively variety in the urban landscape disappeared, and Porto appeared as a long carpet of fired clay tiles. What we had thought of as a crowded promenade along the river looked much sparser from our vantage. There were lots of people up on the bridge, walking along with us, and gawking at the view below. It was fun to look down at the alleyways of the Baixa. Just a while ago we had walked along them, complaining to each other about the multiple stairs we had to climb. From our height those elevations looked flattened. I took the photo shown above because it shows the road going over a pretty steep flight of steps. You have to look carefully to recognize that; the steel railings are the main clue. Soon we had left Porto behind us and walked out over the river. We could see barges and tourist boats passing below us. A tram rattled by on the rails next to us. As I turned to follow it, I saw that one has a lovely view of the city from up on this deck (see the featured image). The river port of Gaia on the other bank is synonymous with the Port trade. We took the teleferico down. We hadn’t decided yet where to begin exploring the world of Port, so, more or less by default, we walked into the Espaço Porto Cruz. This all-in-one place has a set of videos on the port trade: simple background information which you could google, but it is good to have it all together in a video. We also walked into a movie which shows how the wine is made and transported. Interestingly, you do not pay for any of this. The building also contains a shop where you can taste port, at a small cost. The ticket on the teleferico gave us discounts on the port at another cave nearby, so after finishing up here, we walked to the other place. It was a nice big room lined with posters explaining the trade, with comfortable benches placed by long tables. We settled down to a slow tasting. The Family liked the ruby, and I found that I preferred the white. We sipped our ruby, tawny. and white, as the evening’s shadows lengthened outside. Then we took the Metro back to Porto. In late spring markets in Portugal were already full of summer fruit; we’d found very sweet cherries and peaches already. At the same time, good strawberries were still available. Since we had an apartment in Porto, we decided to go to the city’s famous Bolhao market to see what we could find. As we entered the front gate of the market the aisles were lined with booths which seemed a little touristy, and were surrounded by tourists. A few steps further in, the tourists were thinner on the ground, and we could spend some time looking at what was on sale. The front was full of cloth which had something to do with food, embroidered table coverings, for example. The Family stopped here to buy a few things. I looked at a stall across the aisle from this which had a variety of wine. I hadn’t yet found my feet with Portuguese wine, so I looked carefully at what was on sale. The front half of the market, until the central fountain (photo here) seems to sell mainly finished products. Stall on the left aisle had cheese. 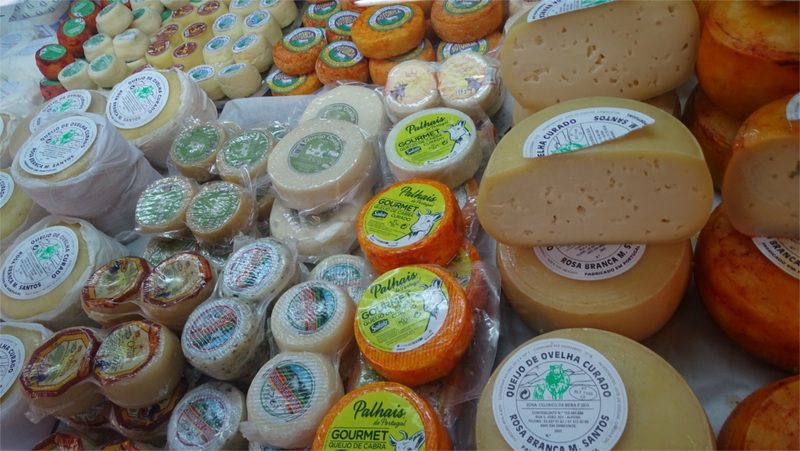 I’d quickly looked at a couple of blogs on Portuguese cheese before leaving, and had been tasting them every day since, so I’d begun to know my way around them. Mentally I’d started dividing them in the most obvious ways: were they made of cow (vaca), sheep (ovelha) or goat (cabra) milk, and was the milk cured (curado) or raw (cru). I hadn’t begun to look at the DOP label, which marks out a protected designation of origin, ie, geography. What I’d met till then were the semi-soft and hard cheeses. I’d liked several, but was looking to try the really soft variety. Unfortunately, it seemed that you could only buy the full rounds of these. Since The Family does not eat cheese, this would have been too much cheese for our stay in Porto. 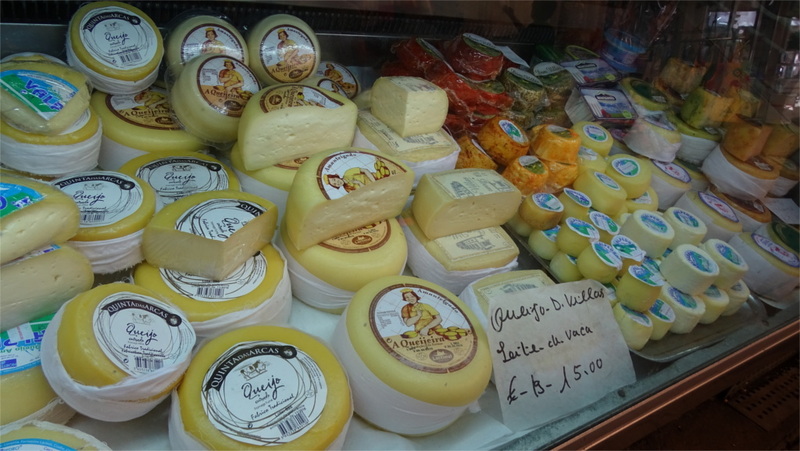 I hope there will be opportunity to extend my familiarity with Portuguese cheeses in future. I couldn’t miss the bread stalls nearby. I could tell that they open early, because the shop keepers had begun on an early lunch. 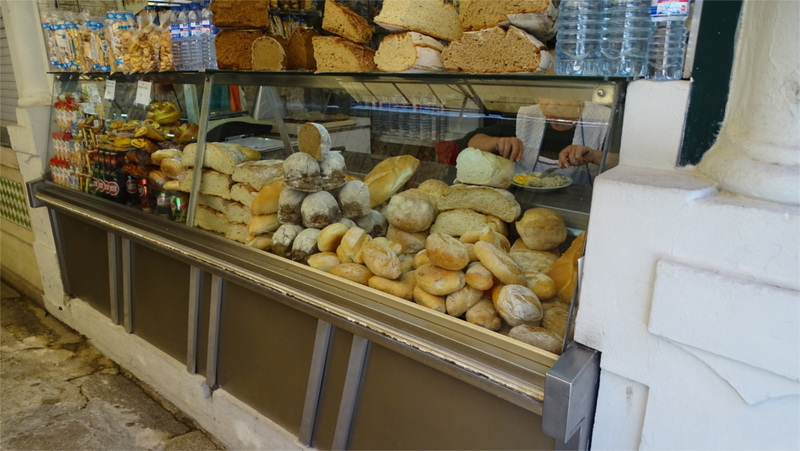 Portuguese bread comes in a large variety. We’d become fond of the soft crusty rolls which we would eat for breakfast and dinner. Here we tasted some of the larger breads, especially the darker varieties, and liked them. Again, we did not buy the loaves because we were not going to be able to finish them during our short stay. The Family and I don’t like to discard uneaten but edible food, and this limits what we can taste while travelling. For now we discovered that the art of bread making is well-developed in Portugal, and we would have a good time discovering more about it in future. No description of Portuguese food is complete without talking of fish. Preserved cod, called bacalhau, is everywhere. The Family loved this, and would eat it with steamed potatoes every few meals. 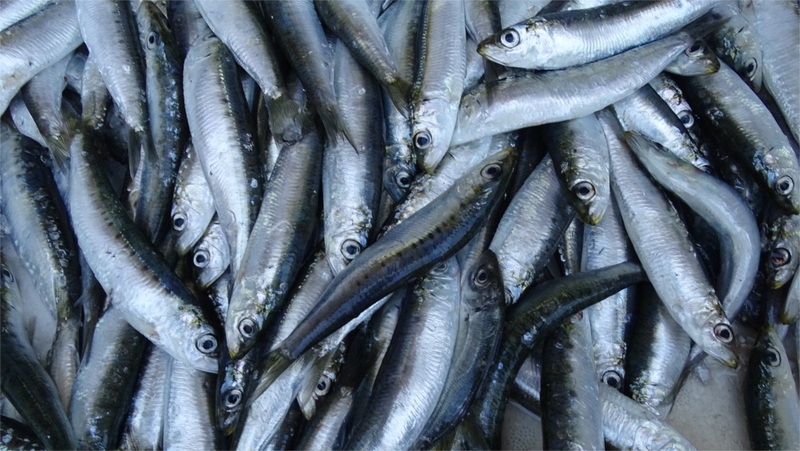 I loved the sardinha (sardines, see the photo above), which were mostly served grilled. The corner of the market where you could find fish was fascinating. We saw a large variety, including some which we didn’t have the faintest idea of how to cook. We sighed over a large swordfish, and moved on. The upper level of the market was a splash of colour (see the featured image). It was where you could buy crisp and fresh vegetables and fruits. We lingered over the fresh produce, and bought a large quantity of fruits. We were walking a lot each day, and one can eat quite a bit of fruit while walking. The avocados, tomatoes, garlic, pumpkins and chilis were eye catching. We looked at the vegetables and sighed. We had a kitchen, but no spices. Our time in Porto was too short to set up a kitchen which was stocked well enough to cook with all the fresh vegetables on display. We loved what we ate in Portugal, and the market showed us what ingredients go into the Portuguese kitchen. We saw nothing which was completely new to us, but everything looked fresh. That is possibly the real secret of this style of cooking. We’d decided to stay near the Boavista place during our trip to Porto. It is a little outside the touristy part of Porto, but a place which made us feel comfortable. The big sight here is the grotesque memorial to the defeat of Napoleon’s army when it tried to invade Portugal. 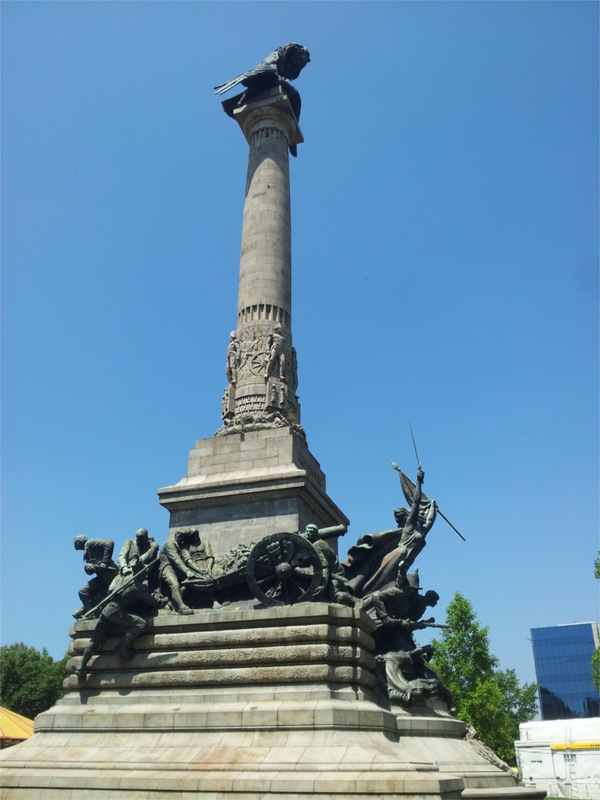 The triumphal sculpture of the Portuguese lion mangling the French eagle was made by Alves de Sousa, and sits atop a column designed by the local architect Jose Marquez da Silva. 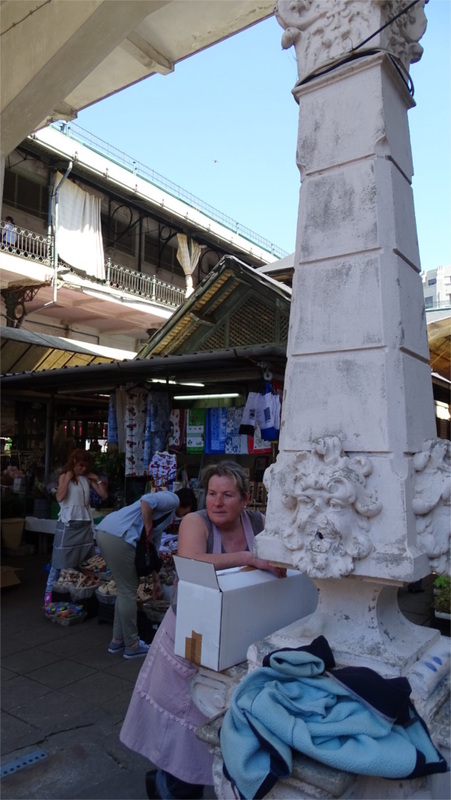 There was a little fair in progress around it, and a young girl helped me to take the photo shown alongside by moving the barriers around the column. Obrigado, senhora. A few paces away is the Casa de Musica, an innovative piece of architecture by Rem Koolhaas. We thought it would be impossible to get tickets for any performance by the National Orchestra, which is housed here. We could have taken a tour of the inside, but, strangely, we could not harmonize our time with this. This was an area with few tourists and a lot of local people. We enjoyed walking down an avenue with fruiting orange trees along it (photo here), and also lovely small lanes. 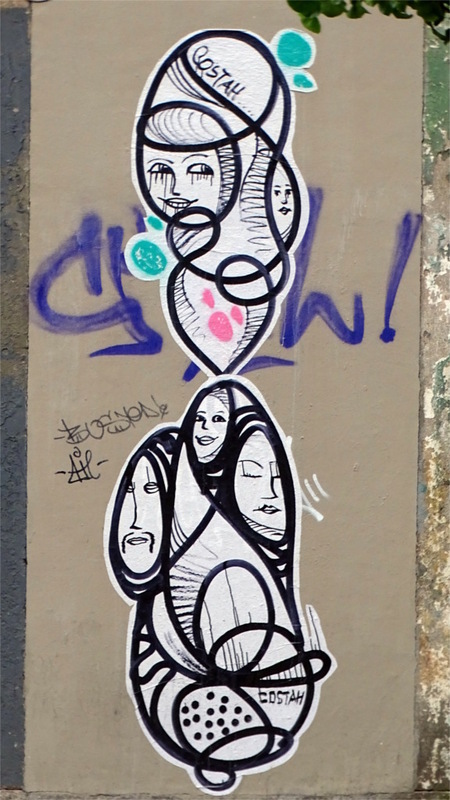 We admired the street art around us (photo below). There were shops with fruits: sweet cherries, ripe apricots and peaches, nectarines. There were two bakeries a few paces away from our apartment. One had the wonderfully named Bolo Reis (King of Cakes) displayed proudly in the window (featured image). We walked in to ask whether we could buy a portion off the loaf. Another customer acted as a translator, and the resulting conversation seemed to tell us that we could only buy it whole. We thanked the baker and the translator and said this was too much for us, and left. We’d hardly gone a few paces when our translator came running after us and told us that we could get a part of Bolo-Rei. Something had clearly been lost in translation. We got our piece of cake, and it was wonderful, even with the filling of squash. Obrigado, meus senhores. We’d lucked out in choosing a place to live in. Porto is not a place full of grand monuments; it is a place to enjoy living in. We loved the city. 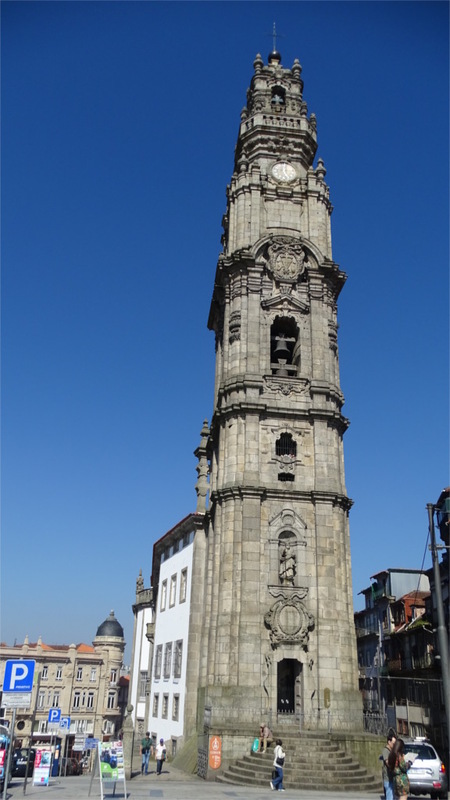 When you are in the centre of Porto it is hard to miss the 18th century Clerigos tower. As it loomed over the skyline, it made a good landmark for me to navigate by. Just as its architect, Nicolau Nasoni, is hard to miss when you are in Porto. As I rapidly skimmed the pages on Porto’s architecture which Google collected at my request, the name of Nasoni popped up again and again. After visiting the cathedral we decided to walk to the Clerigos church. 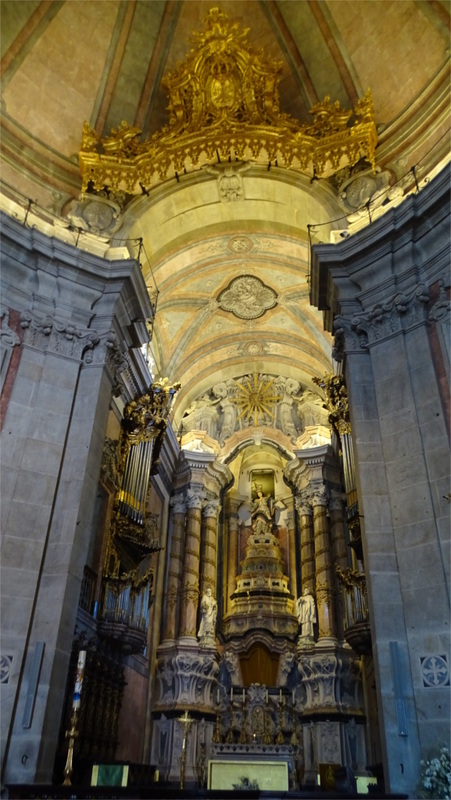 Porto’s center is very compact, and it is a really short walk between the cathedral and this lovely Baroque church. The inside was quite as ornate as a Baroque church is expected to be (see the detail of the vault in the featured image). The striking exceptionality of the design is that it stands in a very narrow parcel of land. The interior is terribly cramped, as you realize when you squeeze past other tourists. But when you sit down on one of the benches in the church, the perspective feels like you are in a spacious church. The manipulation of perspective becomes apparent only when you approach the altar or the decorations on the walls: they are much higher than you expected them to be. This is Nicolau Nasoni’s masterpiece. He probably thought he hadn’t done anything better, since he chose to be interred here. 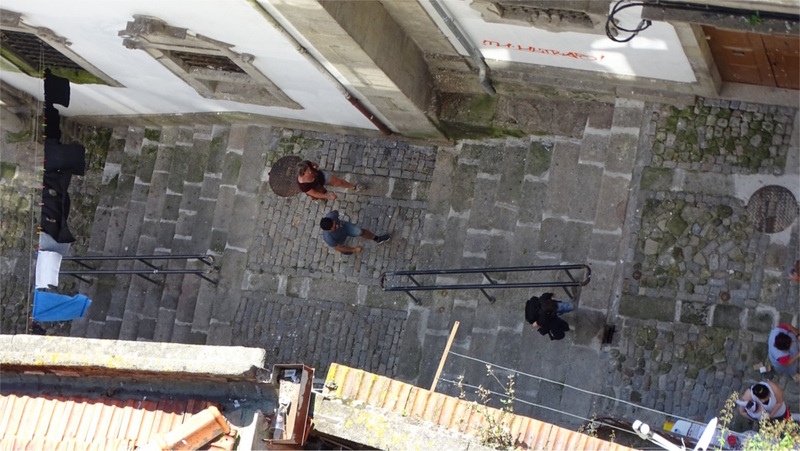 We did not have the energy to climb the high tower and look out over the rooftops of Porto. We walked out and found that in the square behind it (Largo Amores de Pedrição) there is a large building which houses the Portuguese Center for Photography. The building was under renovation, and the exhibits were essentially in one downstairs room. It was a small but nice collection, and we were happy to spend some time looking through it. 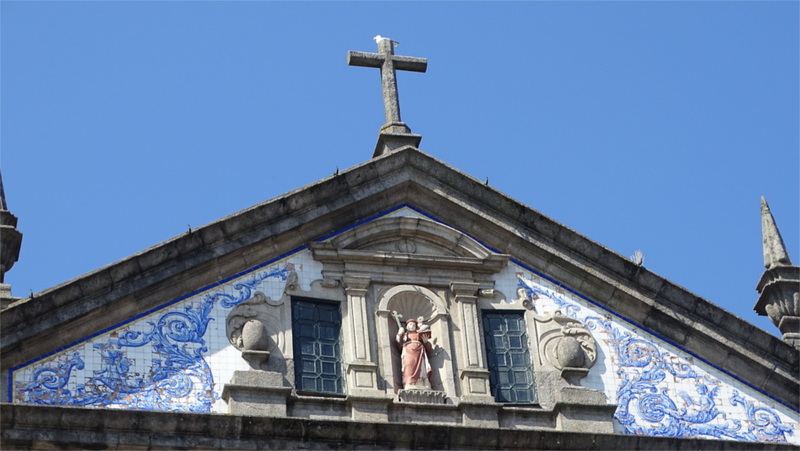 The cathedral of Porto is near the Sao Bento station. As we walked up to it, the bright sun was behind the twin towers of the cathedral, and in our eyes. The Family said that it does not look very impressive from outside. We walked into the interior gloom. The cathedral did not look very impressive inside either. 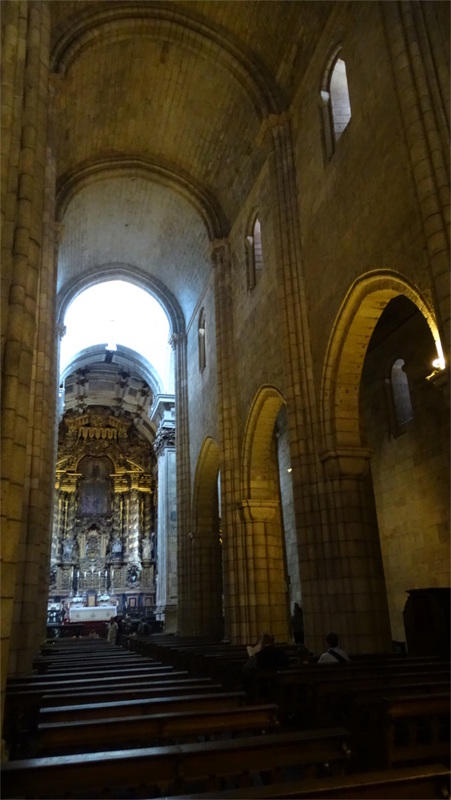 A narrow but high nave was topped with the barrel vaulting typical of Romanesque churches. The baroque porch from which we had entered was clearly added on much after 1120, when this part of the cathedral was completed. The Family took a closer look at the chapels and the decoration while I sat on a bench and nursed a bad knee. The entrance to the place of worship is seldom ticketed, and this was no exception. However, you had to pay to enter the cloister attached to the cathedral. We duly paid up to enter the much more interesting Gothic cloister built during the 14th and 15th centuries (see the featured image). The azulejo panels at this level were designed in the early 18th century by Valentim de Almeida. The tiled panels on the upper level, which you can see bits of in the featured photo, were designed by Antonio Vidal around the same time. We walked around the quadrangle. One of the doors leads to a renaissance staircase designed by the 18th century Italian architect Nicolau Nasoni who built many landmarks around the city. We peered at this, then walked around to the treasury inside the chapterhouse. We walked in a daze past shiny pieces meant to impress and suddenly spotted the odd decoration shown alongside. 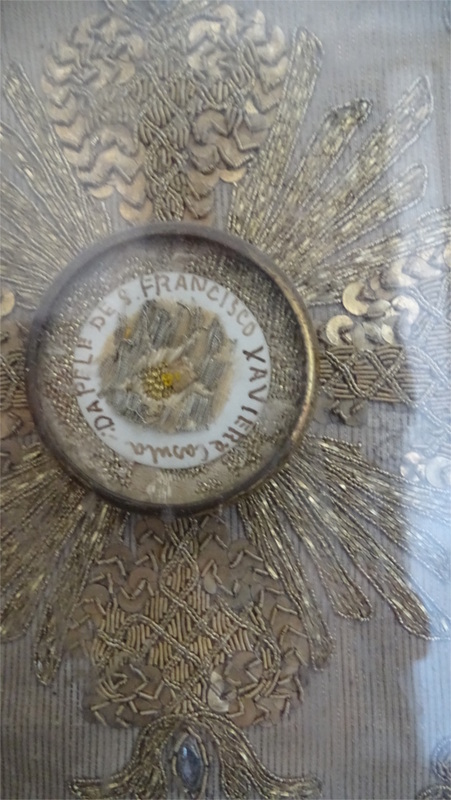 Could it really be a piece of the skin of St. Francis Xavier? We clicked a photo for our friends from Goa, and moved on. Baroque paintings decorate the roof of the chapterhouse. We admired them and moved up to the terrace. One can take a closer look at the tiled murals here. These are genuinely beautiful, and totally Portuguese. We looked up at the steeple with a statue of a saint brandishing a cross from his niche. A sea gull sat on the large cross atop everything. Weeds grew out of the mortar. We’d noticed before that the once powerful church has entered a little bit of a backwater in this century. We went down by Nasoni’s stairs. The broad steps, evenly spaced, are very good for the knees. If you ever wonder why an architect has to design stairs, try descending a long flight of stairs made by amateurs. Your knees will tell you how bad they are. There was a guide standing in the cloister. We asked her where Nasoni was buried. She did not know. As we exited we asked the lady who sold us the tickets where we could see Nasoni’s grave. She excitedly told us that no one knows. According to her he was buried somewhere in the cathedral, but the records are lost. Later we googled this and found that he is buried in one of the famous churches he built: the church of Sao Pedro dos Clerigos. 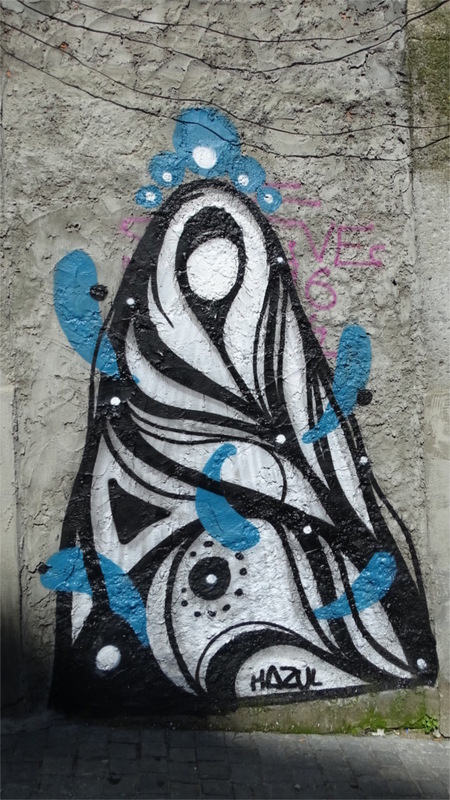 If you were to walk down a street and come across works like the ones above, you would certainly stop to admire them. 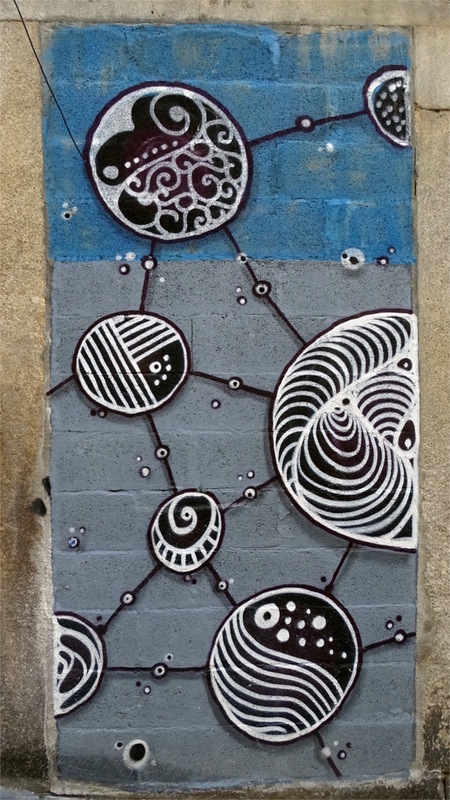 The Family and I walked through the centre of Porto and its Baixa, looking at many things, including these beautiful, and possibly ephemeral, pieces of art. The redevelopment of Porto seems to have stalled in recent years because of the global economic downturn. Not only has the economy shrunk, but unemployment has been very high. A possible result is that right in the centre of town there are "mixed use" blocks of flats like in the picture above. There are flats where people stay, and water the flowering plants on their balcony, cheek by jowl with flats lying open and unused and painted over by quick-response street artists. 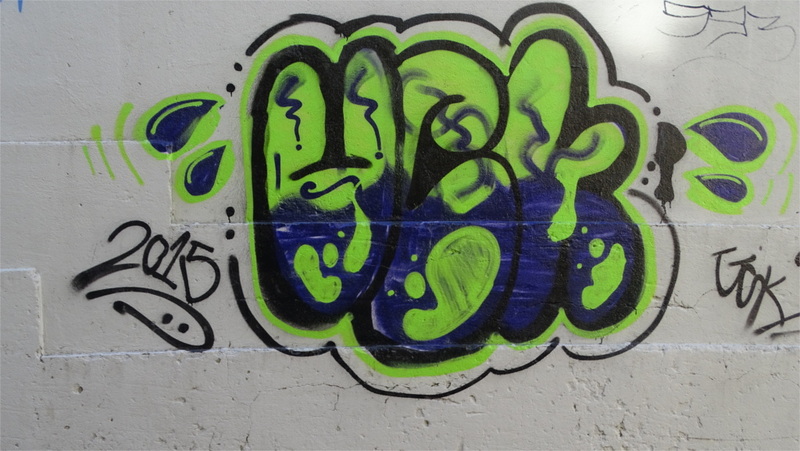 This kind of graffiti also has individual styles: sometimes in the choice of colours, sometimes in the decorations added on to the letters. We walked slowly through Porto for a few days, admiring these differences. The decorative touches in the example above made us happy that we did not run into this work gang, although we liked the colours. But the most exciting pieces go beyond lettering and gang signs. This fish is incredible. 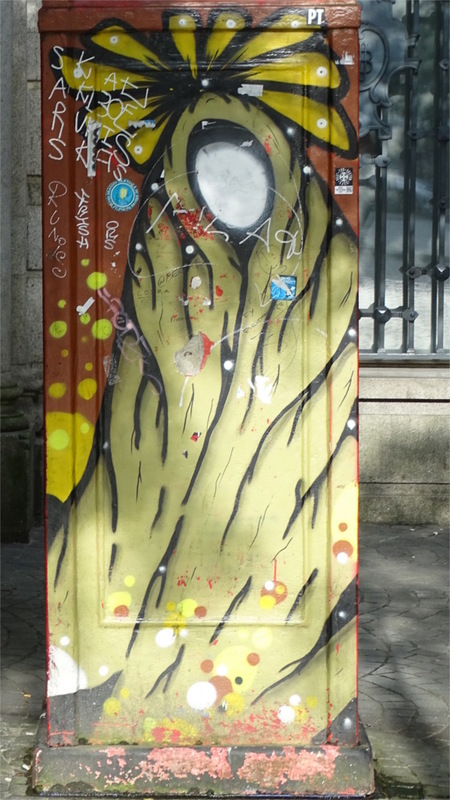 It stands on Rua de Sao Bento da Vitoria, when it emerges behind the Clerigos tower. We stopped to admire it, and found that we were not the only one. It was a lovely complex piece, beautifully executed. 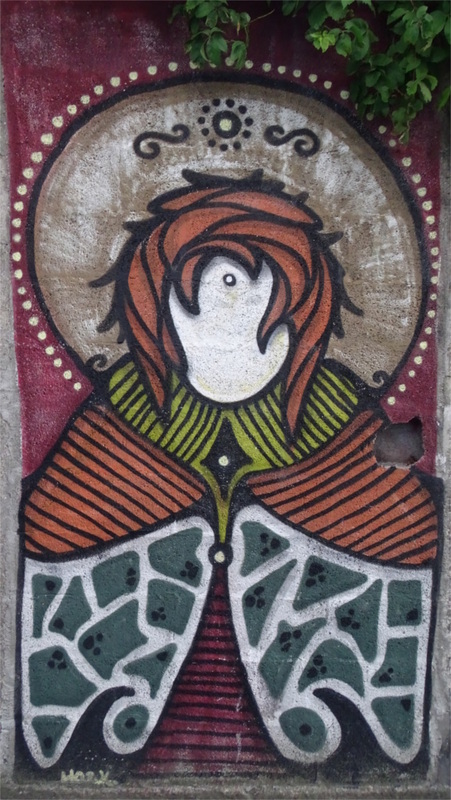 On Rua de Sa da Bandeira, we saw this beautiful minimalistic aesthetics on the wall of an abandoned building. I liked it as it is, although this could be an unfinished piece. 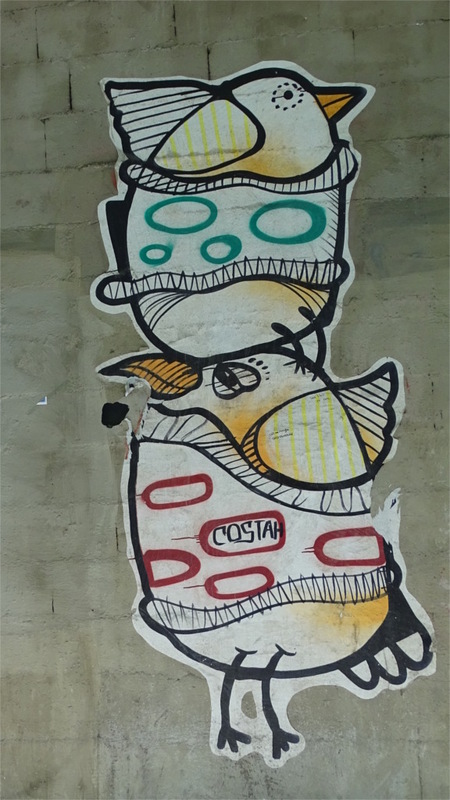 The reason we thought this could be unfinished is that we saw a similar piece as we climbed the steep lanes from the Sao Bento station towards Batalha. On the steeply sloping street two artists had placed their works next to each other. 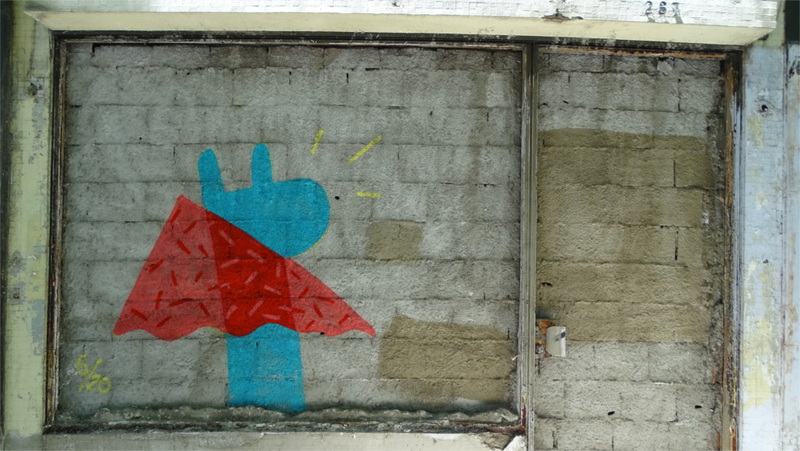 The work on the left is a version of the minimalistic piece that we saw near Bolhao. That on the right is signed by an artist (or consortium?) called Hazul, whose work we began to recognize. A beautiful example of Hazul’s work is in the featured image. 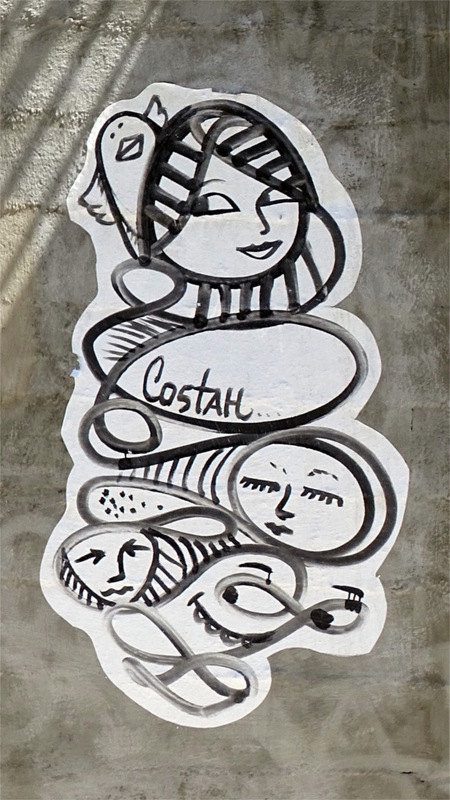 The three pieces above are all by a person (or group) who signs as Costah. The stylistic similarity was such that we began to recognize his work on the road, and would be delighted to identify his signature on a work. 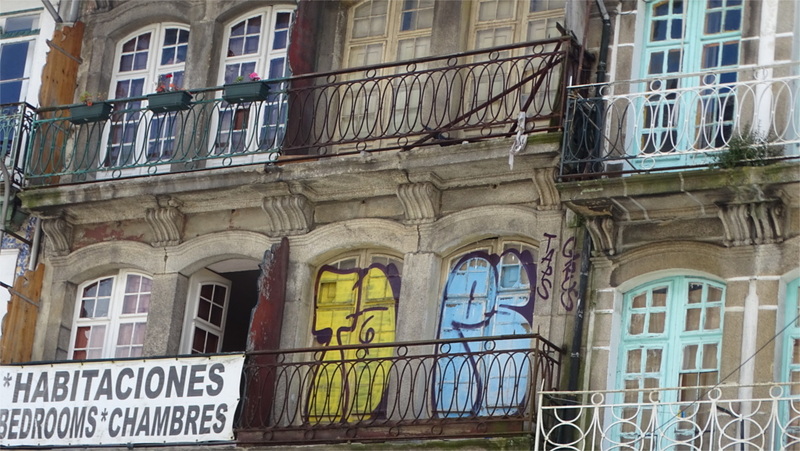 The three pieces above are collected from various parts of central Porto. Even more prolific than Costah is Hazul. Three of the pieces that I like best are collected together above. 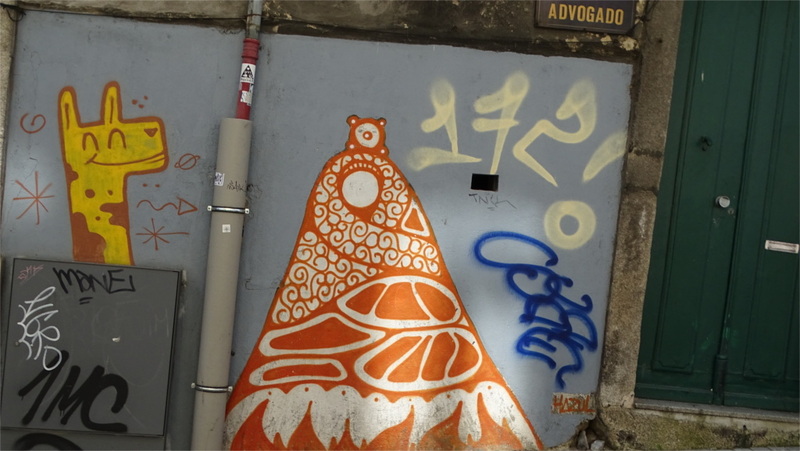 Hazul seems to range all across the main parts of Porto: the Baixa as well as the Alto. There were beautifully realized pieces, clearly complete, as well as pieces which seemed more sketchy. Could they be works in progress? I wish I could go back in six months to check. These signed works are so beautiful that I wish the city takes steps to protect them. There are other artists who are beginning to create an individual style. Maybe there is genuinely a movement beginning in Porto. One of the first things we had thought of doing when we read about Porto was to visit the Serralves Museum. In recent decades the space where contemporary art is shown had also become a statement about modern architecture. This museum, designed by Alvaro Siza, and completed in 1999, is one such (one view is in the featured image). The accounts that I had read spoke of the integration of the building with the large garden around it. If one is forced to choose only one thing to see in Porto, it has to be this. Unfortunately, when you are a tourist, things do not always go your way. We arrived at a time when the foundation was busy preparing its garden for an upcoming weekend of interaction with the public. One part of this involved closing the garden for a week. We could peer into the garden from the windows of the museum, and from the gate, but could not stroll around it. C’est la vie, as we said to each other. Our unfortunate vie that day involved missing out on the Casa de Serralves, which is an Art Deco structure, the gardens, and the artwork and installations in the garden. The Serralves Museum, nevertheless lived up to its reputation. There were four exhibitions on when we visited. For us the most attractive was the one on the work of Silvestre Pestana, a Portuguese artist whose work we had never seen before. The panorama above was a work which took our breath away. 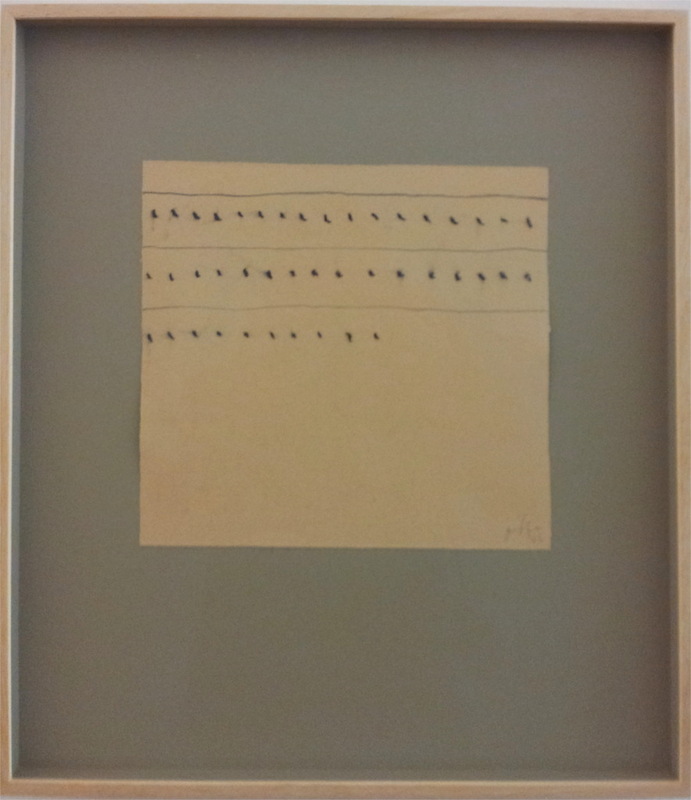 Some of the works were poems by Pestana. I’m afraid a barrier of language closes this off from those who do not speak Portuguese. However, the remainder of the works, often integrating music and flickering neons, videos, and performances take one’s breath away. The Serralves is reputed to be very picky, but this certainly told us of the vitality of contemporary Portuguese art. In another wing of the museum there was a retrospective of the work of Giorgio Griffa. The main body of his work dates from the 1960s and 70s, although there was also a section of his work from later periods up to the 1990s. This isn’t contemporary, but it was interesting to view these works all together. Especially interesing was the early period, when art was being re-examined in terms of the simplest objects that make it up. A beautiful example is in the photo alongside. Two other exhibitions were going on. One of them was supposed to build an exhibit over time, and would have required repeated visits over a year to appreciate. Our general sense was of a very vital place, well worth visiting during every trip to Porto. We walked into the library, book shop and cafeteria. All of them were very satisfactory, adding to the general sense of having seen something worth our short time in Porto. Porto slopes down from a height to the Douro river and comes to an end at the river bank. 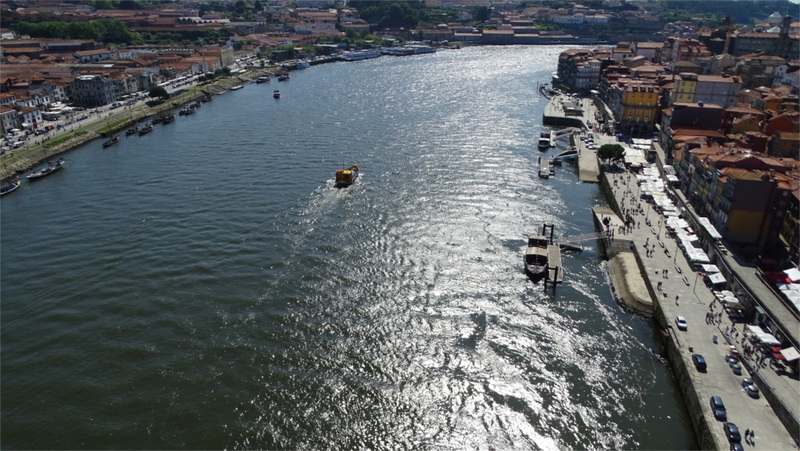 The river separates it from Vila Nova de Gaia, a town which is a tourist magnet because of its warehouses of Port wine. Five bridges cross the river from Porto. On our first evening in the town, we decided to take a cruise along the river and under the bridges. The westernmost of these is the Arrabida bridge (photo above), completed in 1963. The single arch across the river was once the longest in the world. This was one of the two works of Edgar Cardoso, one of Portugal’s iconic engineers, which we saw. The deck of the bridge, and the traffic it carries, passes high over the boat. Porto stretches even further to the west, right to the shores of the Atlantic. As the boat passes beyond the bridge, you see the river widening out, and Vila Nova de Gaia coming to an end. The river cruise turns around well before coming to the ocean. 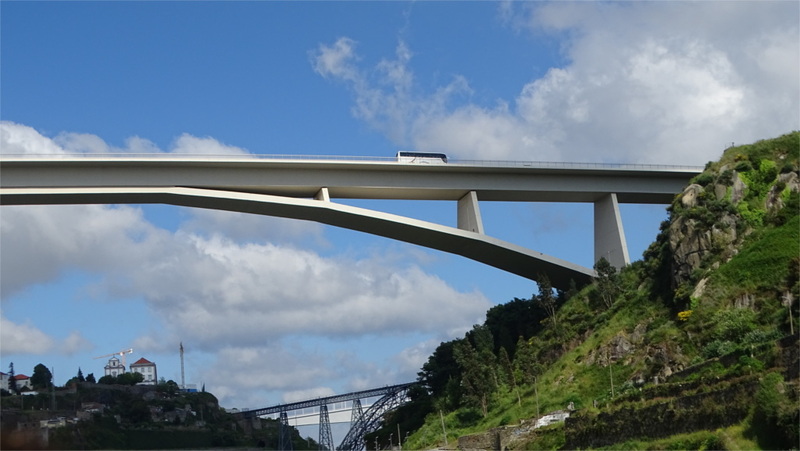 Dom Luis 1 bridge (featured photo) is the iconic bridge of Porto. The double decker bridge was completed in 1887 and had a record arch span at that time. The bridge was designed by Teophile Seyrig, who had earlier worked with Gustave Eiffel. The upper deck was strengthened by Edgar Cardoso a century later. We saw trams crossing the upper deck. All other traffic crosses along the lower deck. As we passed below it we saw three other bridges lined up ahead. The next bridge up river was the Ponte Infante Dom Henrique (photo above). It was completed in 2003 by Antonio Adao da Fonseca. I admired the clean modern lines of this concrete bridge as we passed below it. Beyond this were a pair of railway bridges. 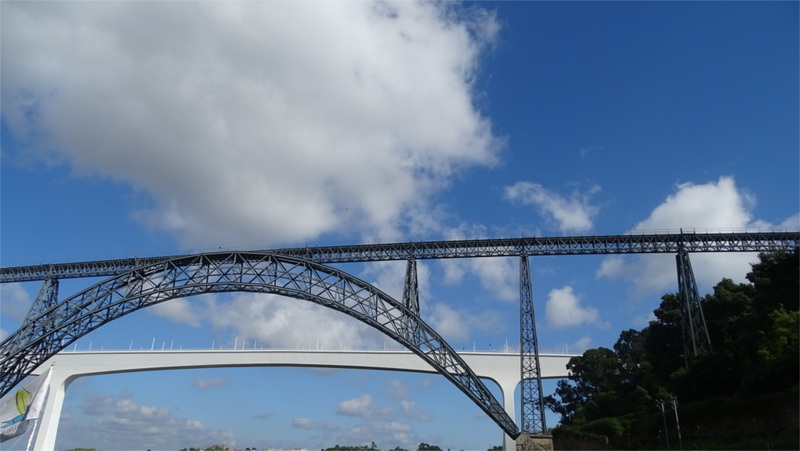 The Ponte Maria Pia (photo above) was the first of Porto’s bridges. Gustav Eiffel’s engineering company, then little known, designed and completed it in 1877. Teophile Seyrig, who then worked for the company, is usually credited with having designed it. At that time it was the longest single arch bridge in the world. It was superseded in 1991 by the bridge we passed under next. 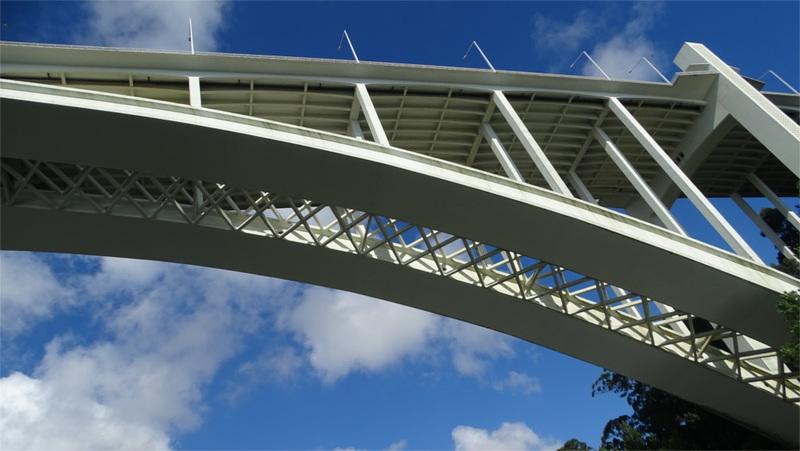 This is the concrete Ponte de Sao Joao (photo above), designed by Edgar Cardoso, and completed in 1991. The boat ride lasted about an hour. Interestingly, there are no explanations or commentary during the ride. You see what you want to see. Fortunately, I had taken the time to read up on the bridges before, so I could appreciate them. There must be much along the river which I missed. I am not a fan of continuous commentary, but it would be nice if there was a cruise which could point out the main structures of interest as we passed them. 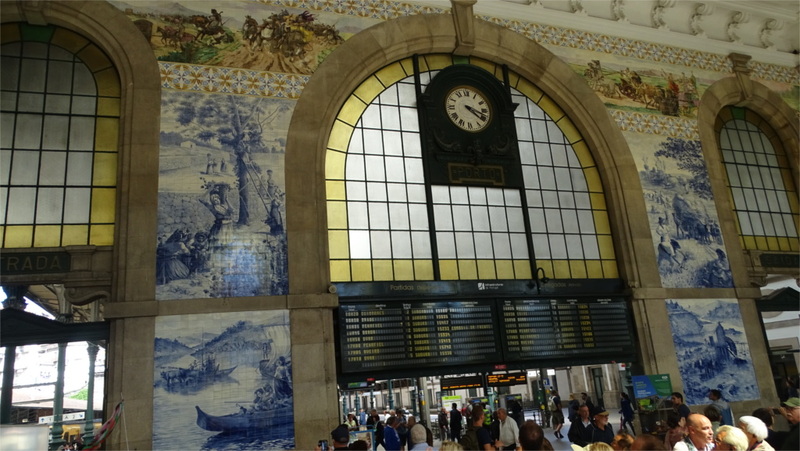 It would have been wonderful to arrive into Porto through the Sao Bento station. Unfortunately the Alfa Pendular express trains seem to prefer Porto’s Campanho station. We took some time to check in to our apartment and have lunch before we could set off on exploring the town. Our first stop was the Sao Bento station. 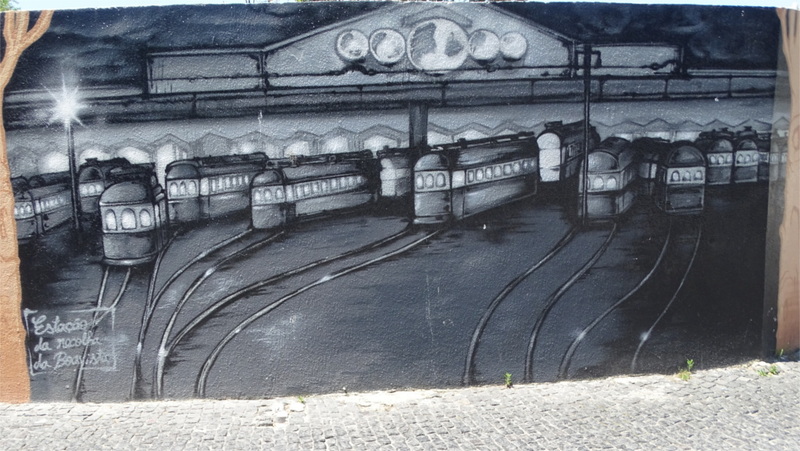 It is a few steps from the Sao Bento Metro station. The distinguishing feature of the station are the gorgeous panels of azulejo tiles which cover the entrance vestibule. There are supposed to be twenty thousand of these. Together, they illustrate some of the key incidents in the history of Portugal and the history of transport. They are the work of Jose Colaço, a painter who is largely famous for his large tile panels. As you can see from the featured image, the painter’s training in perspective and colour are evident in these panels. We spent a while gawking at the tiles before we set off on exploring the rest of the town. Over the next few days, this became a familiar spot from which we would start on many walks across Porto. I asked "Portugal?" She said "Yes." That’s how we decided to spend about 10 days in the country which Goa has a lingering relationship with. 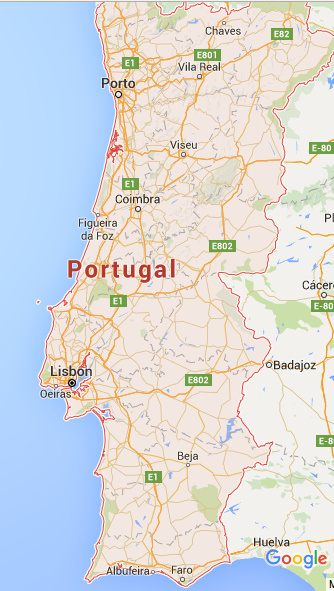 Portugal has an embassy in Delhi certainly, but its only other representation in India is a consulate in Goa. As a result, if you apply for a visa to Portugal from Mumbai, then your application is processed in Goa. As we discussed this, I checked up on my faint memory that Portugal’s current prime minister has a tenuous connection to Goa through his father. These relationships are only in the mind, as I found when looking for flights. There is no direct flight between Mumbai, Delhi or Goa and Lisbon. There is so little I know of modern Portugal: only a handful of people, and a wonderful film on the Portuguese musical form called Fado. Even there, the movie was made by Carlos Saura, a Spaniard. I browsed a list of Portuguese film makers, and realized that I haven’t seen modern Portuguese movies. I score slightly better with Portuguese novelists. I recalled that a google search for the name of the bridge which joins Panaji and Vasco in Goa led me to a stunning photo of the Vasco da Gama bridge in Lisbon. We are looking forward to Portugal: it will be a journey of discovery. We blocked out our basic travel plans. Although the country is not large, we have too little time to cover it thoroughly. We decided to skip the south entirely. The main stops then will be Lisbon, Coimbra in the center, and Porto in the north. Coimbra seems to be the historical center. 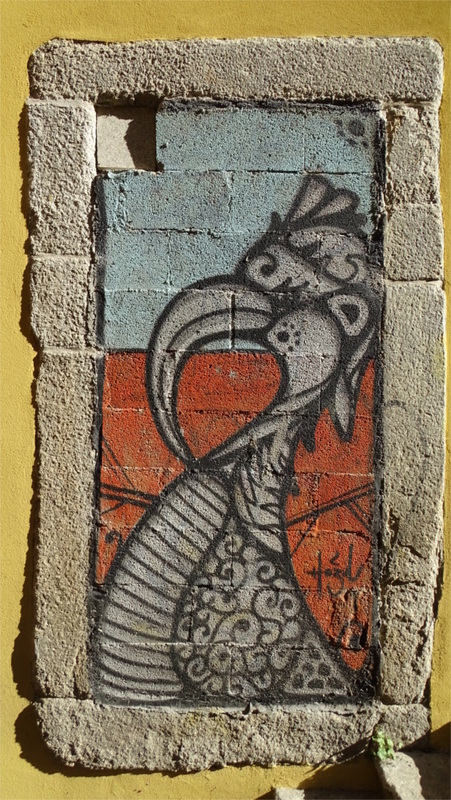 Porto is the gateway to history: with access to paleolithic art, and Celtic and Roman remains. Lisbon also looks like a lovely town, as does Sintra nearby. Now the work begins: there is a lot of reading, viewing and listening to be done.